to join its award-winning team, for both national and international touring! Shaun Parker & Company is one of Australia’s most far-reaching dance companies, having toured extensively internationally to 18 countries across Europe, the Middle East, Asia, and the United States. Based in Sydney, the Company has delivered a range of award-winning dance theatre productions, outdoor festival works and transformative dance education programs. Shaun Parker & Company has secured funding until the end of 2020, having been awarded 4-Year funding from the Australia Council, as well as multi-year funding from Create NSW. Shaun Parker & Company is renowned for its powerful, humanist dance theatre productions, which have touched audiences across the globe, transcending borders and demographics. The Executive Director drives the strategic management of the Company and oversees the delivery of its vibrant artistic programs. Reporting to the Board and to the Artistic Director, the Executive Director supports the Company’s artistic vision with strong management and producing skills to generate and implement the Company’s repertoire of world-class productions at a national and international level. Producing to international festivals and venues is a major focus of the position. Contribute to leading an organisation that takes its award-winning cutting-edge, and innovative dance productions to the international stage. Collaborate with and get exposure to international networks, with regular attendance at international arts markets. Create employment opportunities for the Company’s outstanding creative artists and dancers. Lead and inspire support staff: Full time Associate Producer, Consultant Development Manager, Consultant Graphic Designer, Consultant Marketing/Social Media expert, Part-time Finance Manager, and Bookkeeper. Work with a creative arts organisation with established infrastructure and support including already-secured medium term funding, and a diverse, experienced, and supportive Board committed to agility, pace, practicality, and innovation. Extensive experience and proven track record producing performing arts productions. Experience touring performing arts productions nationally and internationally, and a network of relevant contacts both in Australia and overseas. Management experience at general manager or executive level including contract negotiation and management, overseeing staff, budgets, and grants. Proven ability to identify, develop, and negotiate funding opportunities in both government and private sectors. Experience developing marketing and publicity strategies, and in briefing consultants. A high level of autonomy and demonstrated good judgement alongside a positive, vibrant management style. A commitment to the principles of inclusive ways of working and equal opportunities for our staff regardless of race, gender, sexuality or ability/disability. Lead the strategic direction of the Company in consultation with the Artistic Director and in line with the organisational strategic plan. Represent the Company at the domestic and international Arts Markets, industry events, and presentations as required. Identify, develop, negotiate, and produce new works, artistic programs, and tours (national, and international). Identify and drive new presentation opportunities and income streams for the Company and generate sustainable income from the Company’s repertoire of work. Coordinate all relevant activities and resources involved in the successful delivery of the Shaun Parker & Company program. Manage contract preparation, negotiation and execution. Develop and implement the Company’s international market development strategy in consultation with the Artistic Director. Build and maintain relationships with presenters, stakeholders, partners, and collaborators; cultivate and maintain relationships with national and international venues, agencies, and festivals. Maintain and build advantageous relationships with other organisations to enable partnerships that help meet and/or enhance the Company’s objectives. Develop and manage a comprehensive engagement and communication strategy to grow relationships with key stakeholders within the private sector, government, and non-government agencies, and with donors, sponsors, and philanthropists to further promote and develop the Company and its programs. Provide high-level advice and guidance to ensure the effective administration, governance, and operation of the Company working closely with the Artistic Director and Board. Oversee financial management of the Company’s operations: develop and manage annual organisational and project budgets; supervise finance staff; coordinate financial reporting, and annual audit. Attend Board meetings, reporting on organisational activities, programs and financial status. Provide or oversee preparation of agendas, minutes, and all supporting documentation for Board meetings. Manage relationships with key funders (Australia Council and Create NSW) and manage grant submission agendas: prepare or oversee funding submissions and acquittals for government, philanthropic, partner, and sponsor organisations. In consultation with the Board and the Artistic Director, maintain the appropriate structure to enable the achievement of the Company’s artistic objectives. Apply contemporary people management practices to support a high performing, motivated, and supportive team of staff and contractors including Associate Producer, Finance Manager, Bookkeeper, Development Manager, and any other consultants a required. Be adept in providing support to the Artistic Director, such that they are well positioned to create the artistic works to the best of their ability. Be responsible for the appointment, development, and review of personnel in consultation with the Artistic Director. Ensure that the organisation develops and maintains a strong contemporary brand by overseeing all aspects of marketing and communications including digital marketing strategies. Ensure the delivery of marketing strategies that develop audiences and drive ticket sales. Ensure the Company’s positioning and communications deliver a consistent brand message. Manage the Graphic Designer and Marketing/Social Media consultants where required. Date of commencement: Flexible – In consultation with successful applicant. Join Shaun Parker & Company at Art & About Sydney! Shaun Parker & Company wants YOU to be a part of its exciting new project, TUT. We are seeking up to 100 specially selected dancers/tutters to perform TUT live at locations around the city of Sydney as part of the Art & About Festival!!! Tutting, is a mind-blowing new dance craze featuring highly intricate and rhythmic patterns of the hands, fingers and arms, which was inspired by the hieroglyphics drawn on the Ancient pyramids of King Tut. Click here to find out more or to apply now to be a part of this unique dance event and grab your chance to perform live in the City of Sydney! 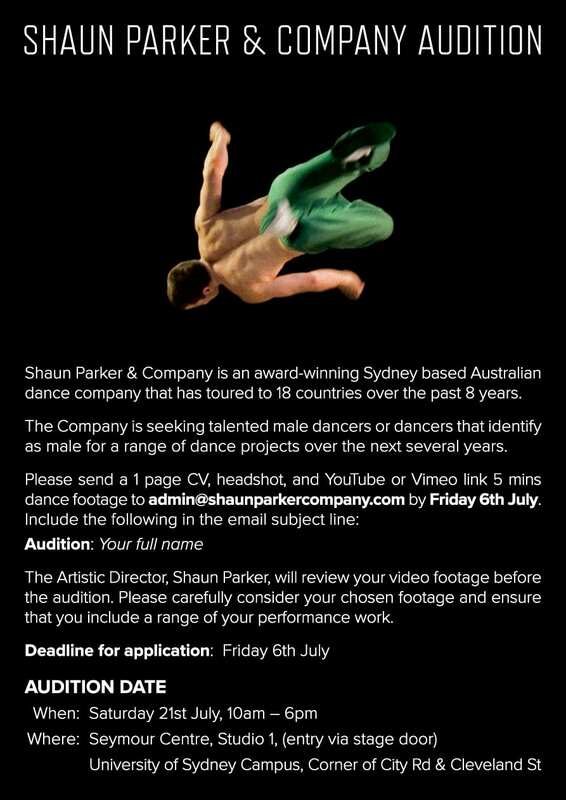 Shaun Parker & Company is making a Call for Applicants for its annual TRIGGER program, which will take place in December, 2015. When: Dec 7th-18th, 2015. 9:30am -6pm daily. Who: We are looking for 5 dancers who were born with the XY male chromosome. ie. Male dancers…or dancers born with the male XY chromosome, but who identify as being female. The 5 chosen applicants will join our Company of 9 dancers who will be working on the creative development of our new work XY. The program will include a daily technique class in yoga and contemporary dance, followed by task based improvisation processes with Artistic Director and Award Winning Choreographer Shaun Parker. This 2-week-long workshop will be free of charge, and is invitation only, so please ensure that you submit a strong application for selection. Shaun Parker will be using this time to develop the skills of the applicants, as well as looking for dancers for various projects for 2016 and 2017. Successful Applicants notified by late October. AM I TO TOUR GERMANY IN APRIL 2015!!!!! The company is delighted to perform in MOVIMENTOS dance festival in Wolfsburg, Germany! April 22nd, 23rd, 24th and 25th!!!!! Congratulations to Shaun and Nick for their nominations in the Green Room Awards! AM I just launched for Melbourne Festival 2014-check out our tour dates and the festival line up! Following the huge success of Shaun Parker & Company’s national tour of Happy as Larry, Shaun Parker returns to the Frankston Arts Centre in January for the Trigger Theatre Residency. This week long residency with acclaimed choreographer Shaun Parker will impart professional theatre skills development and offer daily class incorporating dance, yoga and physical theatre technique along with theatre making and self devising. It will provide an understanding of meaning, movement and dramaturgy, including the deconstruction of Parker‘s production Happy as Larry. Participants will study the concepts behind the work, unpacking the nine personality types that exist, which are based on the Enneagram – a scientific personality mapping system. Involvement in this workshop is by application only. Applicants for the week long intensive must be pre-tertiary, undergraduate or newly graduated to apply and be of advanced technical standard. a paragraph outlining: your five year plan as a dancer and your creative interests. Please contact Geraldine Timmins, Associate Producer on (02) 9351 7939 if you have any queries regarding the submission of your application. SPILL, Shaun Parker & Company’s free 30-minute outdoor production set in the playground, opened today as part of Sydney’s Art & About Festival, Sydney’s annual celebration of public art. SPILL sees four dancers blaze a colourful trail across structures and landscapes of the children’s playground, set to a an electro pop score by composer Nick Wales and featuring four local dancers, Antek Marciniec, Eden Petrovski, Lewis Rankin and Joshua Thomson. SPILL combines quirky, dynamic street dance with high-energy street gymnastics and parkour. Kids will love it, grown ups will love it too! SPILL, which has played 36 parks across the UK and featured as a ten-part series on BBC’s Space channel, now makes its Australian debut as part of Sydney’s Art & About Festival and will activate three very popular playgrounds in Camperdown, Ultimo and Alexandria. Performances are at 10:30am and 12:30pm on each of these dates. Performances will be followed by a workshop with company members where the audience get the chance to learn a brief section of the show. SPILL, a free outdoor production choreographed by Shaun Parker set in children’s playgrounds, is coming to Sydney in September & October, as part of the City of Sydney’s Art & About Festival. 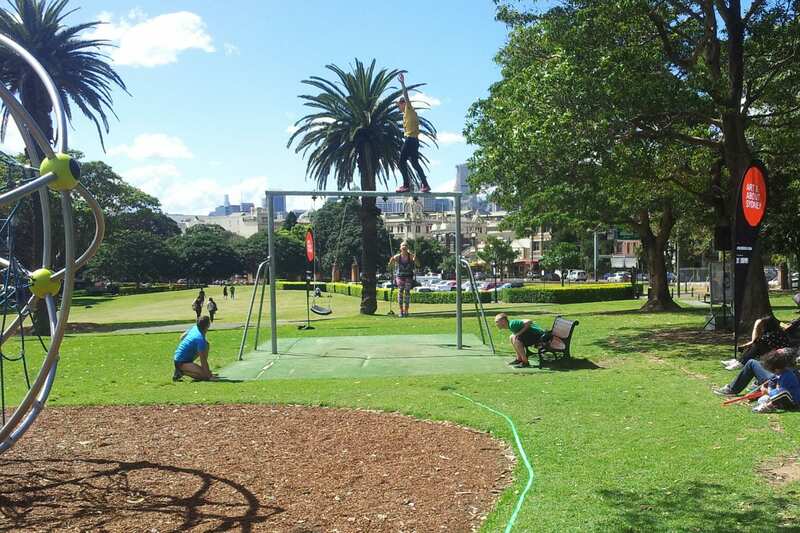 SPILL will play 3 parks around Sydney – Victoria Park in Camperdown, Wentworth Park in Ultimo and Sydney Park in Alexandria. Kids will love it… grown ups will love it too! SPILL is a highly playful and at times teasingly comical dance celebration of the child within. Combining quirky, dynamic street dance with high-energy street gymnastics and parkour, the dancers in this performance blaze a colourful trail across the structures and landscapes of the playground. Each performance is unique as the performers scrambles around, over, under and through swings, slides and roundabouts. Long-time Shaun Parker & Company collaborator Nick Wales creates a pulsating original score to accompany the twists, turns and leaps of this dynamic work. Each performance lasts 30 minutes and is followed by an audience participation workshop with the performers. VOLUNTEER- Would you like to be a part of this Shaun Parker & Company show? We are looking for volunteers to help with the shows. Volunteers will be required to assist in the day to day operations of the performance work including guiding audience members to the best viewing spots and fielding enquiries. Sign up for just one or several days. Interested? Check out the event page below & register by emailing bshipway@cityofsydney.nsw.gov.au. Shaun Parker & Company are so excited to be back in Adelaide! Happy as Larry plays the Dunstan Playhouse, Adelaide Festival Centre this Wednesday 14 to Saturday 17 August. Evening shows are at 7pm and there is one matinee on Thursday 15 at 12pm. Hope those in Adelaide can join us! The Happy as Larry tour has got off to a great start, with shows in Orange, Newcastle and Bathurst this last week and The Cube in Wodonga on Saturday. Take a look at this article on performer Jana Castillo, who is originally from Wodonga. – http://www.bordermail.com.au/story/1634272/jana-castillo-born-to-dance-photos/. Nice leap Jana! On Monday 24 June CAPTIVATE and Shaun Parker & Company were nominated for a Helpmann Award for Best Presentation for Children. Congratulations to everyone involved with this work, in particular our fabulous dancers!